Native Colorado artist Lanny Grant developed an early love and respect for the mountains surrounding his fathers ranch near the small Western Slope town of Silt. Lanny spent his early life exploring the wonders of the high country; fishing trips that became sketching trips are fond memories of early artistic efforts. With little formal art training, Lanny has developed as a fine artist through dedicated practice and work. Studying art history, painting, design, life drawing and sculpture at Adams State College in 1971-1972 helped give a solid foundation on which to build and made him eager to learn more. While studying at Adams State, Lanny made weekend sketching trips to New Mexico, gaining an appreciation for the early master artists of the Taos area. Always applying the fundamental principles, Grant has evolved his own techniques of translating impressions gathered from Nature. 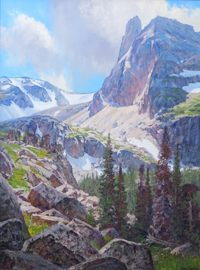 A compelling love for the changing moods of the mountains has drawn him into the high country of Colorado, Wyoming, Montana and Canada to paint. Often working in remote areas, Lanny makes numerous sketches and oil color studies for use as reference in doing larger studio paintings. Lanny feels that the spontaneity of composition and accuracy of color that results from painting on location is invaluable. The result of this dedicated work has been a fresh and accurate portrayal of the many moods of the changing seasons in the Rockies. The quality of light in the alpine country and clarity of color come through in Grants paintings, drawing the viewer into them to perhaps re-kindle a personal memory of the mountains. Lanny is a signature member of Rocky Mountain Plein Air Painters and has participated in the group shows and events since 2002. Paintings by Lanny Grant are included in numerous private and corporate collections. In 2002 Grant was commissioned to create a painting of Mount of the Holy Cross to commemorate the 1993 visit to Colorado by Pope John Paul II. The painting is now part of the permanent art collection at the Vatican in Rome. In 2004 the State of Colorado acquired a Grant original oil of Vail Valley which now hangs in the Governors reception area at the Sate Capitol in Denver. Paintings by Lanny Grant have been featured for many years as popular greeting cards by the Leanin' Tree Publishing Company in Boulder, Colorado. Lanny has had paintings included in the 'Top 100' finalists in the annual Arts for the Parks competition in 1995 and 2002 in Jackson, Wyoming.